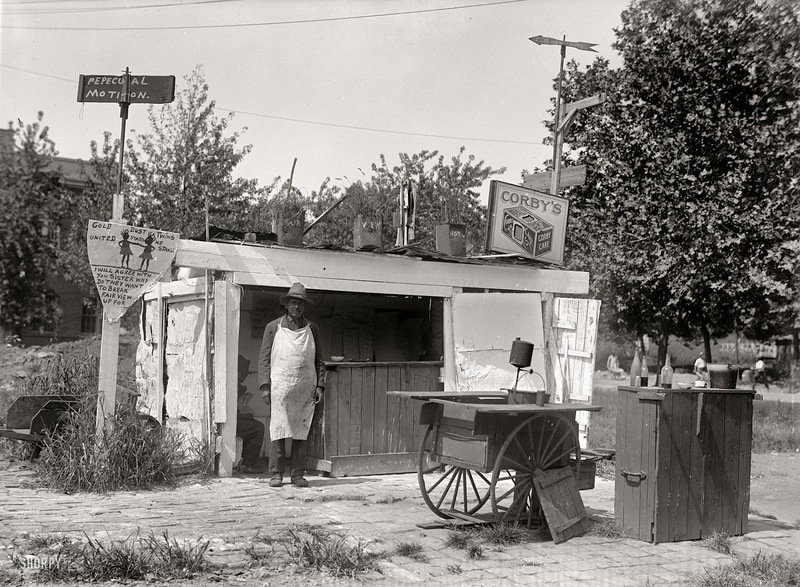 The image of a sole shopkeeper tending his roadside stand at 1st Street and Florida Avenue, NE at first does little more than remind Washingtonians about the rural nature of what was then still considered the edge of town, when the image was taken shortly after the turn of the twentieth century. Upon closer inspection, however, the image reveals walls covered with philosophical sayings and observations, some of which might not ever be explained. The image certainly is a rare snapshot of a lifestyle experienced by hundreds of thousands of post Civil War African Americans that eventually flooded Washington DC in the search for jobs in the decades following the War. Sutherland eventually opened a ramshackle food stall at 1111 R Street, in the heart of Hells Bottom. In 1897, a Post article reported that there were hundreds of such stands, located in nearly every alley of the city. It read: “The alleys of this city are filled with colored cook-shops, which heretofore have paid no license fee…only the police and the people who visit the numerous alleys and little streets of the city know how many of these cook-shops exist. 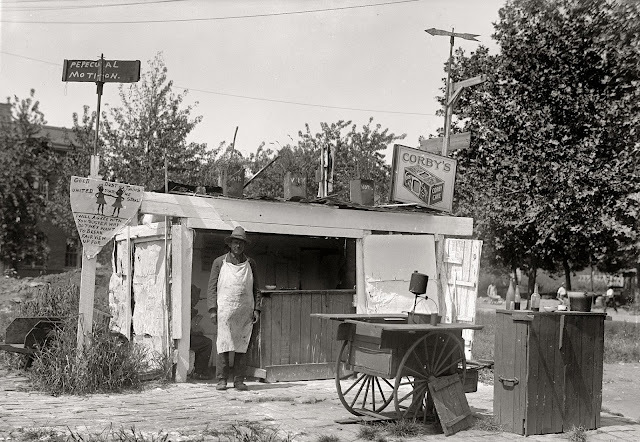 The colored people generally resort to these places for pigs' feet, meat pie, and substantial provender prepared by the old mammies and quaint old colored men who run them, and cook dishes to the taste of the people of their race.” (Washington Post, January 1, 1897). At the time, Sutherland was fined $25 for not having a license, as a new enforcement took place. In 1900, Sutherland was interviewed at his stand in Hell’s Bottom, which offers a rare glimpse into life in the neighborhood at the time. He stated: “There were two very lively places in those days. One was a triangular square at Rhode Island avenue and Eleventh street. It was here that an eloquent colored preacher, who went by the name of ‘John the Baptist,’ used to hold revival services, which were attended by the newly-freed slaves. The revival was all right, but the four or five barrooms in the neighborhood used to hold the overflow meetings, and when the crowds went home at night you couldn’t tell whether they were shouting from religion or whisky.